Purpose: Chronic pelvic pain affects many women in reproductive age in the US and laparoscopy is common in the diagnostic algorithm. In the realm of NOTES, a transvaginal approach would be a natural approach to reduce incision sites, postoperative pain and improve cosmesis in this patient population. This is the first report of transvaginal diagnostic peritoneoscopy with tissue biopsy using a flexible GI-endoscope. Methods: The study was designed as a prospective phase 1 study and approved by the institutional IRB. Inclusion criteria were women of reproductive age over 18 with a minimum 6-month pain history. A 20 year old patient fulfilled the criteria and was enrolled. Under general anesthesia and lithotomy position, a 5 mm transumbilical port was placed for laparoscopic exploration and pneumoperitoneum created. After placement of a 10 mm trocar via posterior colopotomy, a conventional gastroscope (GIF-160, Olympus) was inserted into the pelvis and peritoneoscopy performed. Results: Complete pelvic exploration was performed via transvaginal approach including uterus, adnexae, rectosigmoid, cecum and appendix. Pneumoperitoneum was maintained at 6 mm Hg. Exploration of the deep pelvis and biopsy could be achieved with the gastroscope only while laparoscopy would have required additional ports for retraction. Overall operative time was 66 minutes. Time required to gain trans-vaginal access = 17 min. Transvaginal exploration time = 34 min. Colpotomy was closed with a single running suture. The patient was discharged 2 hours after surgery. Postoperative narcotic intake included 2mg Morphine Sulfate iv and 10mg oxycodone po. On POD 7, pain score was 0 (VAS 0-10) with no narcotic use, cosmesis score (Dunker) indicated high satisfaction. 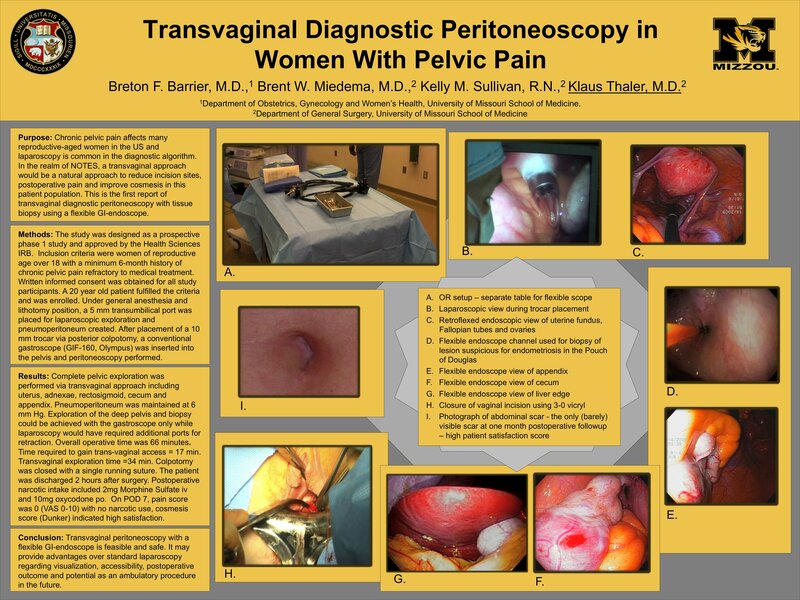 Conclusion: Transvaginal peritoneoscopy with a flexible GI-endoscope is feasible and safe. It may provide advantages over standard laparoscopy regarding visualization, accessibility, postoperative outcome and potential as an ambulatory procedure in the future.